Digital advent calendars can be a great way to drive engagement during December. If you have 24 pieces of content, why not package them up? You don’t have to produce a slick clickable website, an image shared on social media is perfect. Think about how to use your existing digital assets and a theme to give your followers a treat every day. It’s been a hard year and we all need cheering up. If you are thinking about doing an online advent calendar, here are some questions you should ask. 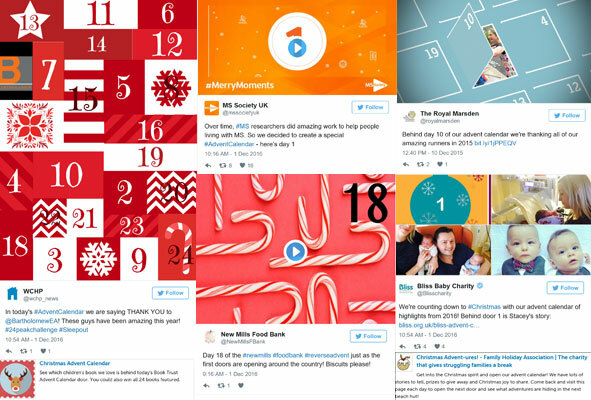 Does an advent calendar fit with your brand? How will your supporters respond to a daily offering? Do you get much interaction from your every-day communications? Look at your stats and find out what type of content works best. A daily treat could inspire interaction if there hasn’t been any or could attract new audiences. Or could do annoy people. Is an advent calendar too flippant for your cause? This depends to some extent on your tone of voice. If you have a serious cause, it is possible. For example Bliss shared stories via a calendar on their website and via #blissadvent on Twitter). 24 days is a long time to do one thing. How can you maintain momentum over 24 days? Avoid a slump in the middle by planning your content carefully. What existing content could you use and what would you need to produce from scratch? Can you link in with other big days in December? Do you have the resources to publish and respond to comments over a whole month including weekends and into the holidays? You can schedule posts via publishing tools such as Hootsuite but will need to keep an eye on responses. If you don’t the energy or resources to cover 24 days, you could scale down to use the 12 days of Christmas instead? See this from the Imperial War Museum. Should you have a theme or goal? awareness raising / messages / campaigns. Think about what will be interesting to your supporters. Museums, galleries and cultural organisations in particular make good use of digital advent calendars to share gems from their collections. Take a look at the Horniman Museum’s calendar on instagram or National Library of Scotland’s #cartogradvent. Some council’s are doing calendars too. This comms2point0 post from Merton Council explains how they are using their collection. How technical should you go? A simple approach is to just share an image on each new day via social media. This method works well if you are an organisation who has beautiful or inspiring images or a collection to showcase. Or have used Canva or equivalent to illustrate quotes. There have been many more gif-based calendars this year. See this example from Community Christmas. Video-based calendars and interactive websites are rarer. Even more unusual is the offline calendar. See Folkstone’s Living Advent Calendar. To build traction over the period, include a short specific hashtag such as AbbreviationOfYourOrgNameXmas16 so #THxmas16 or #BlissAdvent as above. This means people can explore previous days as the month progresses. Include a link so people can find out more or take an action. If not done, this creates a dead-end. The calendar becomes a nice-to-have thing rather than something which drives traffic or action. People are likely to share these types of images so you have the potential to reach new audiences who might not know about you. Spotted any good nonprofit advent calendars? Have you run one yourself? Was it worth the effort? Do you have any top tips? I’d love to hear from you. This entry was posted in Content, Social media and tagged Bliss, Imperial War Museum. Bookmark the permalink. Each calendar image / GIF (whatever format is chosen) should be created with the same look and feel, so that all days tie together nicely. Whatever the objective, the calendar needs to have a consistent theme that ties together all the different days. Example: we’ve chosen MS research, so all items are related to MS research. An obvious one: don’t forget, the calendar continues during weekends… So don’t forget to schedule / publish the calendar on Saturdays and Sundays… Can happen quite easily!